In this photograph, a group of immigrants arrives at Angel Island, disembarking from a ferry boat. Most immigrants from Asia endured a roughly three-week journey across the Pacific Ocean. Upon arriving in San Francisco, immigration officials came on board to inspect passengers’ papers. Anyone who required further review—usually based on nationality or medical condition—were then ferried to Angel Island. Upon arrival, immigrants were separated and housed by nationality and gender, though children under age twelve were allowed to stay with their mothers. 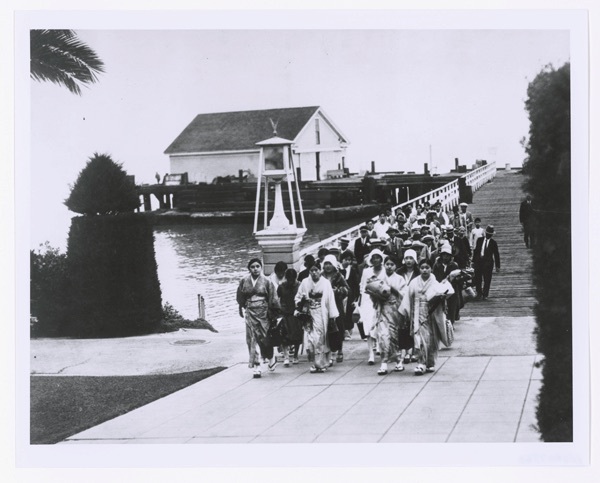 Department of the Treasury, Public Health Service, “Photograph of Immigrants Arriving at the Immigration Station on Angel Island,” Digital Public Library of America, https://dp.la/item/0e5d179427c087217f72e40de07f9b6b.